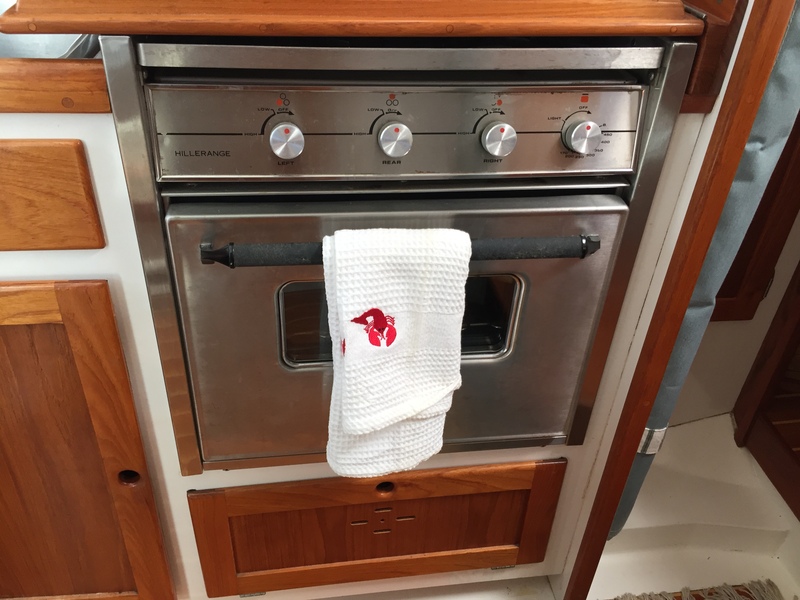 This Wilbur 34 Flybridge Cruiser has a very open feel with a cut away main bulkhead and 6’4″ of headroom in the pilot house and 6’5″ in the forward cabin. 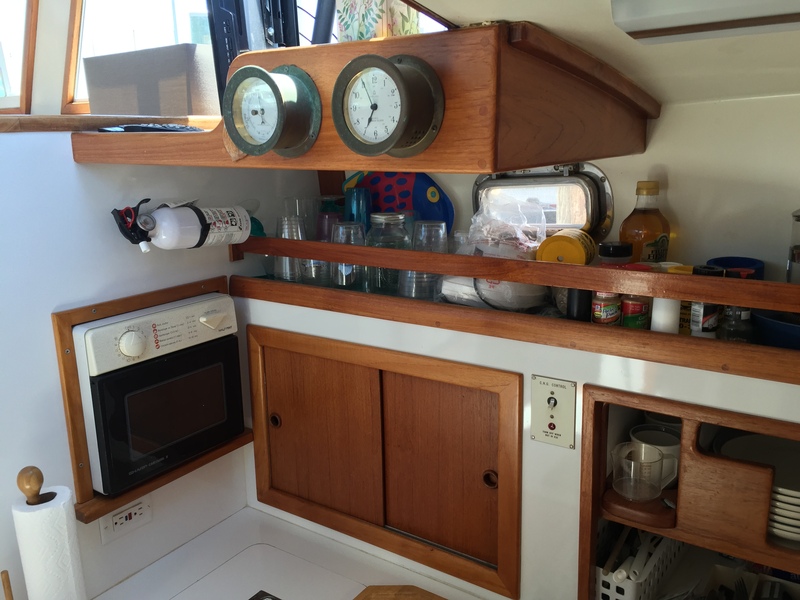 The limited “C” layout in the galley and the custom storage for dinnerware allows for easy conversations and a well organized galley. 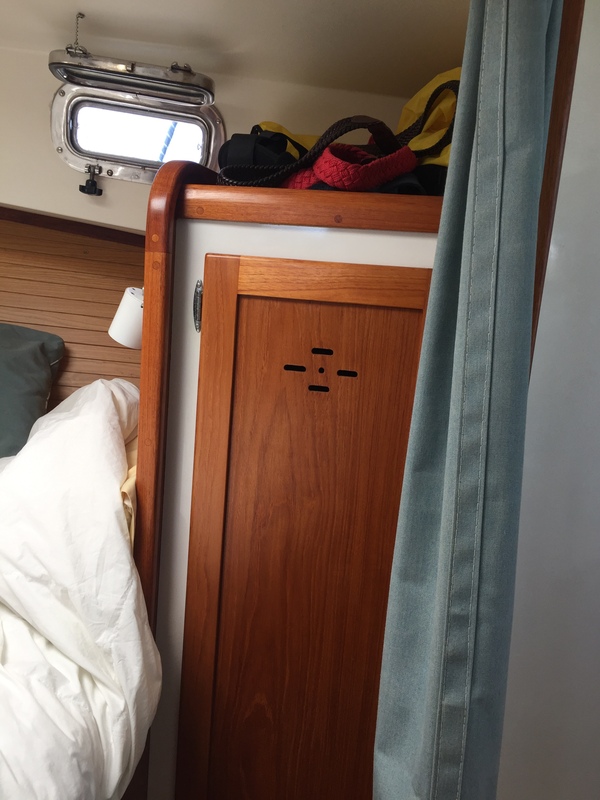 The full bulkhead separating the side loading double from the rest of the forward cabin offers privacy when staying on board. All exterior teak refinished this summer. The single Cummins Powerplant offers a comfortable cruising speed and allows you to enjoy your time on the water. 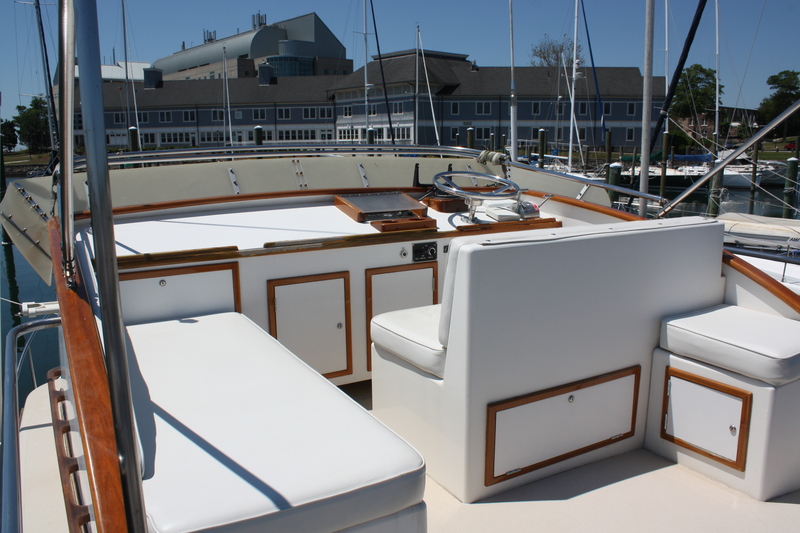 The spacious cockpit is great for entertaining or fishing. The large center line hatch allows easy access to the lazarrette area with a lot of storage and ease of access to the steering gear. 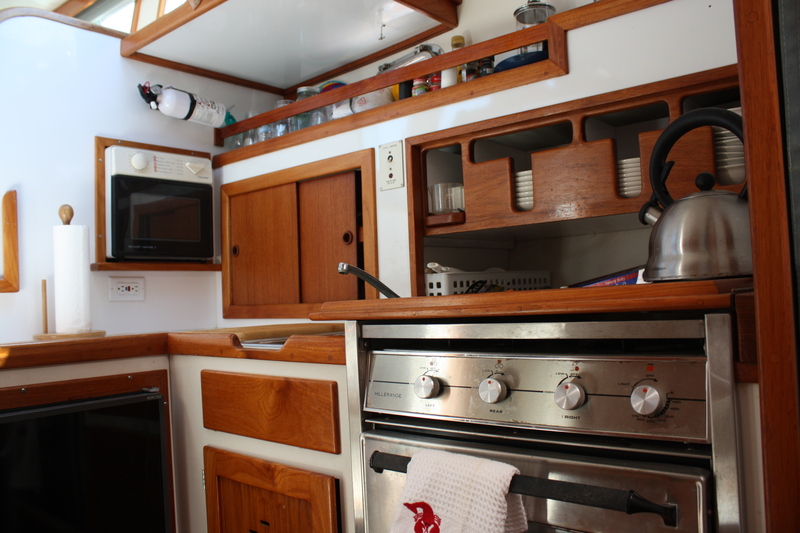 The wash decks with teak coaming boards are the right height if you want to wet a line or just sit and enjoy a leisurely run down the bay. 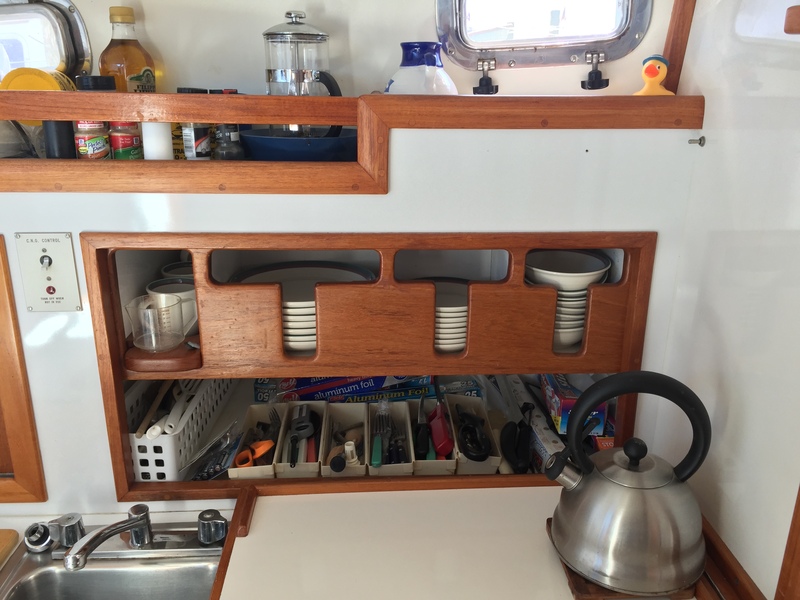 Storage under the wash decks is perfect for a few rods (when they are not in the 4 rod holders built into the wash deck or the rod holders mounted to the flybridge surround), a boat hook is within easy reach, as are fenders and lines. The large SS aft cleats are accessed through hawse pipes in the aft corners of the wash deck and are easily reached but well out of the way so you don’t snag a line or catch a toe. A cockpit cooler allows for a seating option with the cushion and will help keep your drinks cool on those summer voyages. 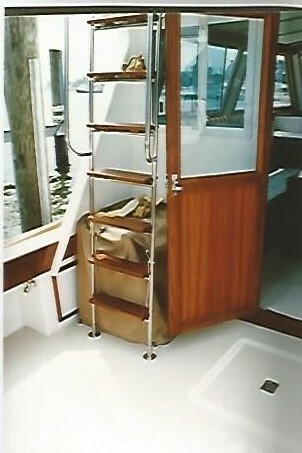 Fly bridge access is via a custom stainless steel ladder and the teak treads add a softer finishing touch. 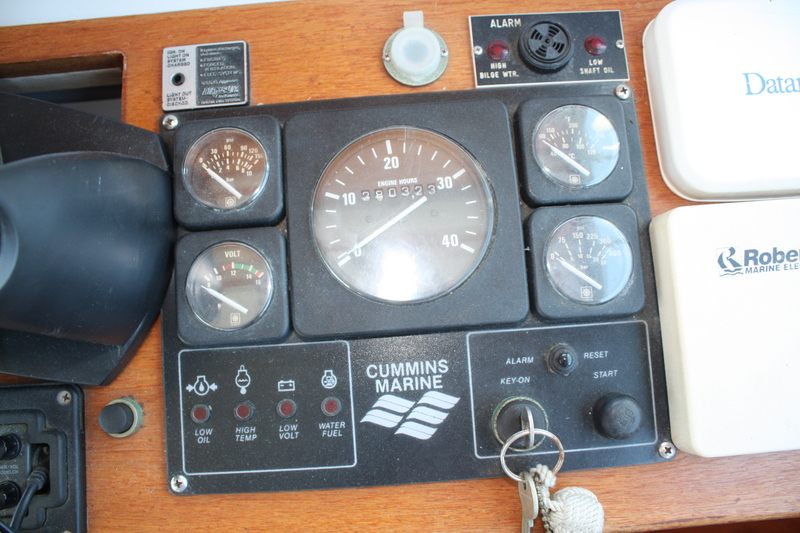 The Salon/Pilot House on this vessel has a comforting feel and is rather well equipped. 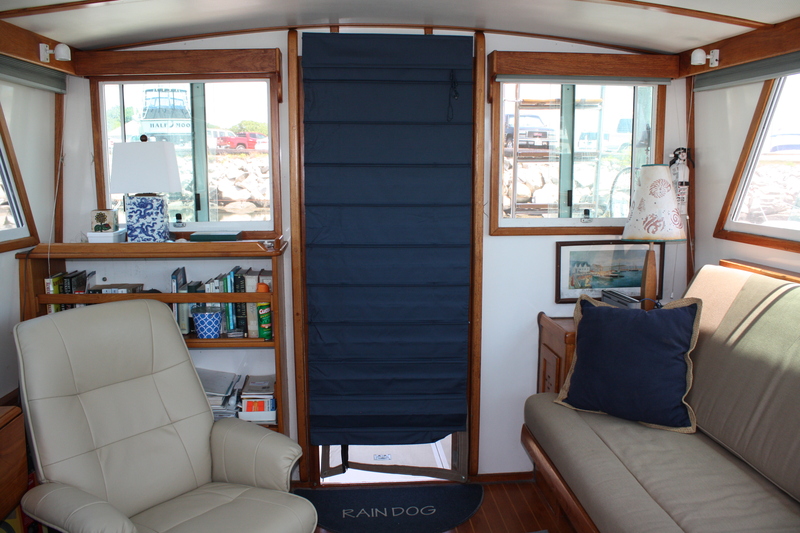 From the custom valances to the pull out settee for an additional berth. 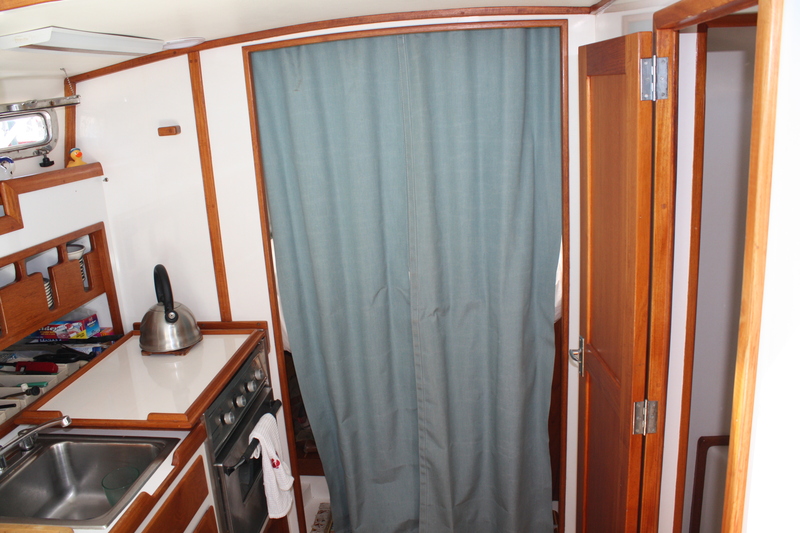 The vessel is very open as the main bulkhead has been cut away for access to the galley area and the head room in the Salon is 6’4″+. The teak and holly sole, throw rug and the soundown perforated overhead combine nicely to finish off the space. The book case aft starboard and the built in cabinets both forward and aft of the settee allows for plenty of storage space and the drop down doors under the settee open that area as well. The large custom teak table with drop leaves can be used in the salon area or moved to the cockpit when enjoying a meal on board and stowage is against the starboard wall in the salon. There are three large access hatches to the engine room just above the engine. Day access is via two smaller hatches – one to port and one to starboard. The large windows allow for great visibility and the all around window treatments will help provide privacy when you are ready to turn in for the night or just want to get away. Screens on the side and aft windows as well as the aft door will help keep the air flowing and the bugs out. The head has a separate stand up shower (with shower wand and seating) and electric Raritan toilet. The vanity has a wash basin, hot and cold pressurized water, storage under and a shelf that is not common on most 34’s. The switchable nico-fico vent will keep air circulating and the “Tank Watch” holding tank monitor will alert you if you need a pump out. 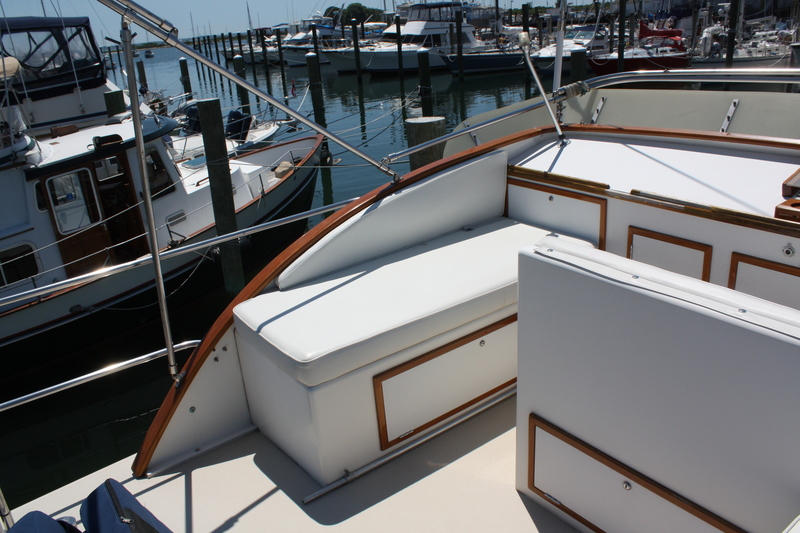 There is a large flybridge with a lot of seating and stowage. The second helm has repeaters for the electronics and engine. 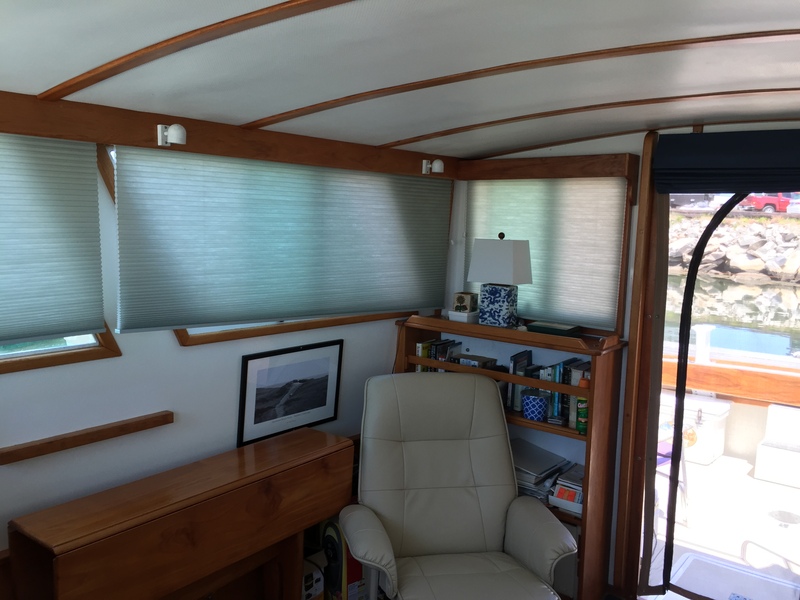 The custom stainless steel flybridge rails have a couple of rod holder mounted and the new (summer 2016) custom bimini top will help keep you out of the sun but can be folded back to allow full sun when desired. There are lockers (with locks), custom drink holders and a cover for the bridge deck when not in use. The exterior of the vessel has full walk around access and ample hand holds. Exterior hardware is marine grade and mostly SS and aluminum. Aft cleats are under the wash deck and accessed via hawse pipes in the cockpit area, the spring cleats are located on the wash deck and the forward sampson post allows for easy tie ups. The stainless steel bow rail extends approx half way back on the trunk cabin. 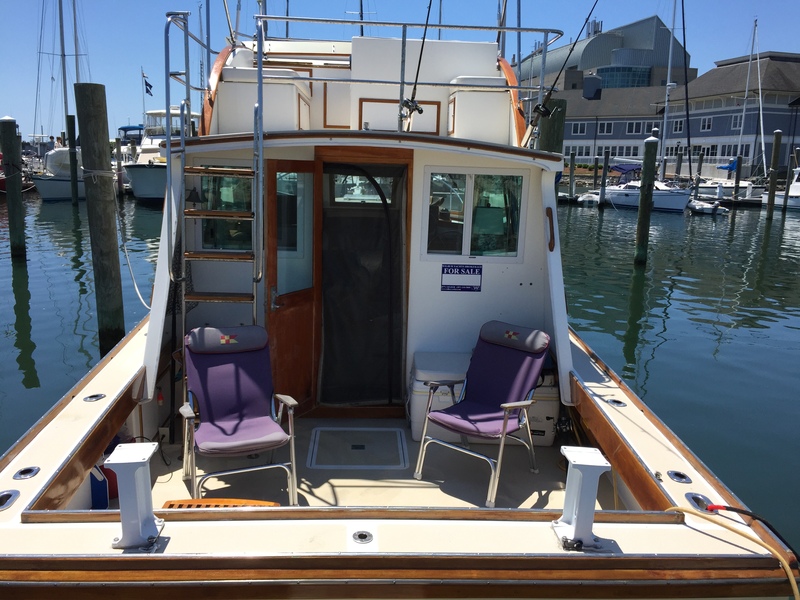 The teak pulpit helps to hold the anchor and rode off the boat and the windlass with foot controls on deck and hand controls at both helms will help when hauling the anchor. 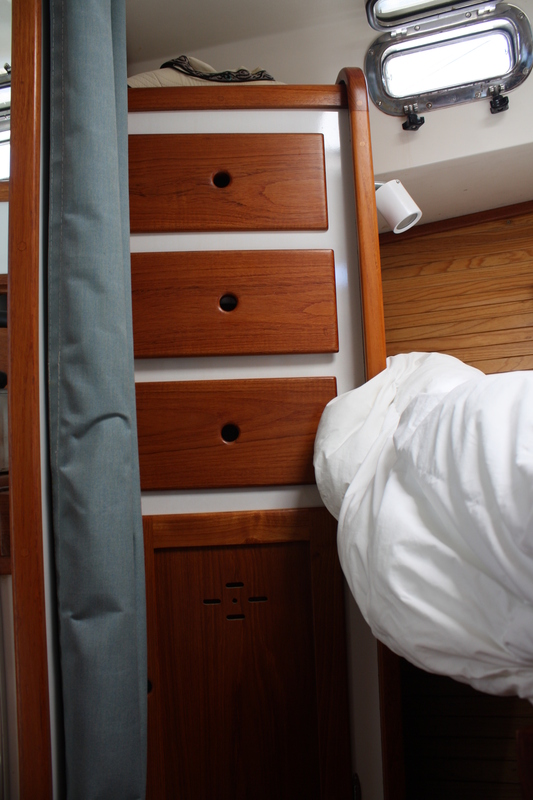 The custom teak boat hook stows in teak bases on the trunk cabin for ease of access when picking up a mooring line. Water and fuel fills as well as the waste pump out are mounted on the side wash decks and allow easy access when filling water or fuel or pumping waste. The windshield wipers on the three font windows (center opening) will help keep the windows clean and visibility sharp. The dual trumpet air horn will sound when you push the button and help alert those around you of your presence.